After Lunalilo's death, another election was held in 1874, this time pitting Kalakaua against queen dowager Emma. Kalakaua won by a huge majority following which Emma's supporters started a riot that had to be quelled by American and British marines. Though Kalakaua was not related to the Kamehameha line, his father, Kapaakea, was great grandson of Kameeiamoku, one of Kamehameha I's strongest supporters. On his mother's side, Kalakaua was related to other Kona chiefs. Educated at the Royal School, Kalakaua held positions in the palace under Kamehameha IV and served 13 years in the legislature. One of Kalakaua's first actions as king was to take a tour of all the islands. He also traveled to Washington - the first reigning monarch ever to visit the United States - and secured a reciprocity trade treaty. There walked up to the verandah a young man whom Mr. Wyllie introduced as the King's [Kamehameha IV] Aide-de-Camp, Mr. Kalakaua. He was a pure Hawaiian, excessively stout, but of most gentlemanlike manners and appearance. Kalakaua married Kapi`olani in 1863. Since they had no children, Kalakaua named his younger brother, William Pitt Leleiohoku, his heir. After William's death in 1877, Kalakaua named his sister Lili`uokalani as heir and regent in his absence. 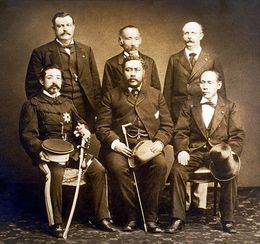 In 1881, Kalakaua took a world tour and visited other heads of state. Upon his return to Hawai`i, he built `Iolani Palace and in 1883, nine years after his election, crowned himself in an official coronation ceremony. In 1886, the Merrie Monarch's Jubilee marked Kalakaua's 50th birthday with a two-week celebration that included parades, fireworks, hula performances, and a public luau. Kalakaua sent his wife and sister to London the next year as his representatives at Queen Victoria's Golden Jubilee. While sugar profits grew and Hawaii's economy flourished, business deals and corruption seeped into government. Business interests wanting more control forced Kalakaua to sign the "Bayonet Constitution" in 1887, reducing his power to that of a figurehead. After a bruising legislative session in 1890, Kalakaua sailed to San Francisco hoping to rest and restore his health. He died there in January 1891 at the San Francisco Palace Hotel.